We thought it might be interesting to take a look at a few events that have recently been in the news, that may have implications for map makers and cartographers alike. 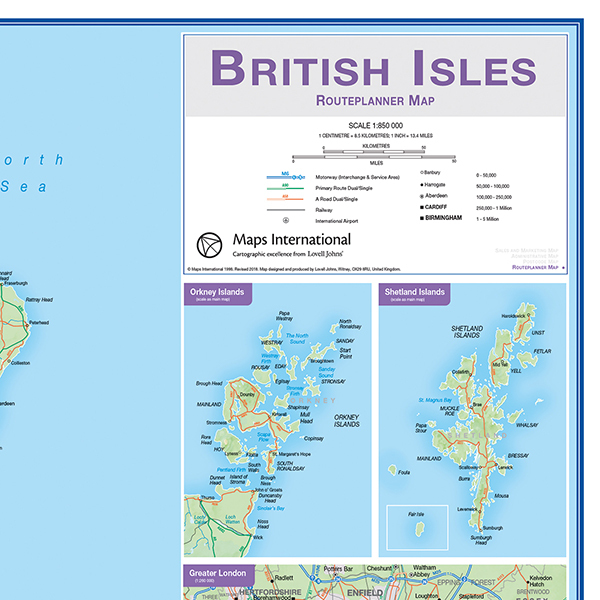 In October 2018, it was announced that official bodies must show the position of the Shetland Islands in their correct geographic location on maps of the UK. The more standard placement of the Shetlands in an inset box is deemed to be a “geographic mistake”. The islands are 152 miles from the Scottish mainland and will reduce a map of the U.K. by approximately 20% in order to accommodate showing the islands in their correct relative position. Any maps scheduled to be printed in China have to go through strict checking to ensure they are compliant with the Government’s guidelines on how the country is displayed. This measure has been taken from January 2018. All maps of China, whether a country map or a world map, must be approved by the State Bureau of Surveying and Mapping, a process which can take up to a year to gain approval. This has led to some Chinese publishers omitting maps of the country in order to avoid this process. With the decision of the UK to withdraw from the European Union, the Republic of Ireland will remain in the EU and will therefore be impacted by customs and immigration checks between the two countries. As discussions are still ongoing at this stage on the finer points of Brexit, it is not known how this will affect travel but the potential introduction of a ‘hard’ border is a sensitive issue. There are currently 275 border crossings but these are all seamless points and may need to be blocked or have passport- and customs-controlled posts. How this will be represented on maps is yet to be decided. 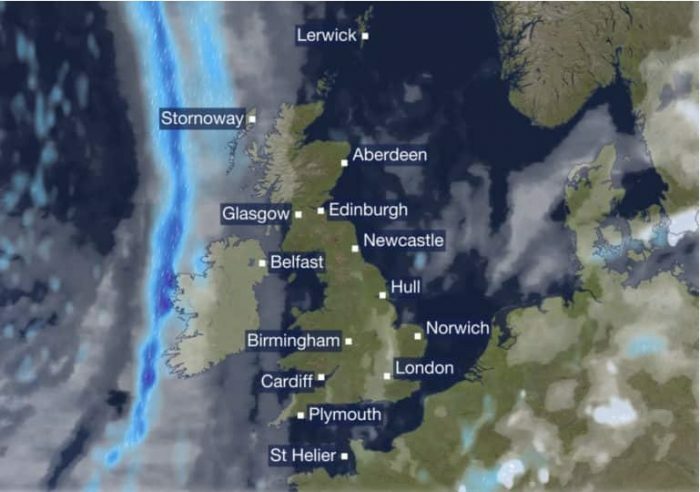 After the outcome of the Scottish Independence Referendum in 2014, various media sources reported that the map used by the BBC Weather programme had an influence in voting behaviour in the referendum. The original map used since 2005 used a projection which reduced the relative size of Scotland and exaggerated the south, that allegedly may have subconsciously made a country seeking independence, seem smaller. The same opinion was echoed by then SNP MP Paul Monaghan who believed that the BBC had made Scotland “literally less significant” with its choice of projection. The new map (below), introduced in February 2018, has been hailed as more representative of the relative size of Scotland, so who can tell what the impact may be if another referendum is held? Finally, maps have always been used to illustrate a bias, whether political or cultural. At many points in history, wars have been fought over land ownership and occupation. 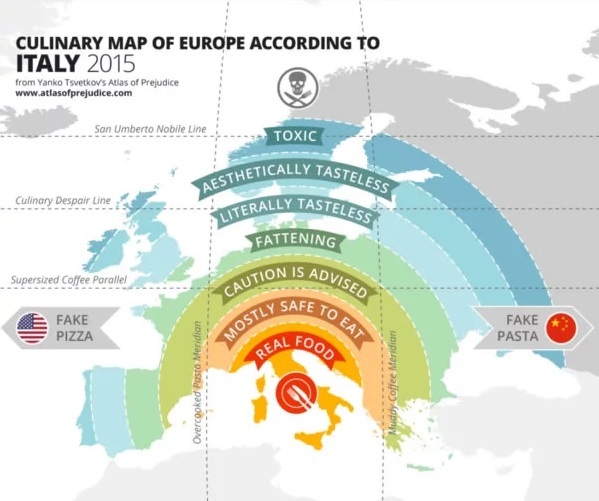 On a lighter note, the image below is a fun culinary map of Europe.